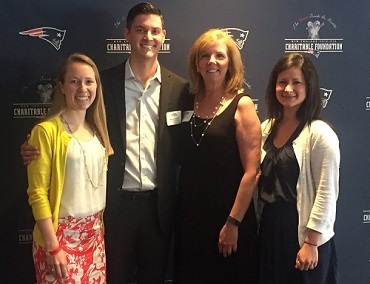 Former Gift of Life Campus Ambassador and now-volunteer Michael Padulsky was honored on June 2, 2016 with the New England Patriots’ Myra Kraft Community MVP Award. Padulsky was selected as one of 25 semi-finalists recognized for their volunteer service to nonprofit organizations throughout New England. For this feat he received $5,000 on behalf of Gift of Life. The award, named for Patriots owner Robert Kraft’s late wife Myra, celebrates her lifetime commitment to philanthropy. The award places a spotlight on those who give their time to help others and exemplify leadership, dedication and a commitment to improving their communities through volunteerism. Patriots Chairman and CEO Robert Kraft, New England Patriots Charitable Foundation President Joshua Kraft, and Super Bowl Champions Tom Brady and Robert Gronkowski were in attendance at the awards luncheon. Michael began running recruitment drives in 2012 with Gift of Life to honor the memory of his older brother, Timothy, who lost his battle to myeloid leukemia in 2008. Recognizing the need to increase the number of marrow donors on the registry, Michael ran his first drive through the club he established while a student at Boston College, Cancer Affects Siblings Too (CAST). The club is committed to honor, support and recognize siblings of cancer patients so they may better face the future with strength, courage and hope. While a student at Boston College, he registered over 200 peers as donors. (l-r) Kayla Hammergren, Michael Padulsky, mom Mary Padulsky, and Marti Freund, Gift of Life Director of Community Engagement. One of the students Michael swabbed was his friend and fellow Boston College student Kayla Hammergren. Kayla was called as a match only five months after joining the registry and donated bone marrow in 2013 to a 2-year old boy diagnosed with leukemia. There have been two other students identified as matches through drives that Michael coordinated.